BELGRADE, Serbia, Oct. 6, 2017 /PRNewswire/ -- At the Trends in Medical Mycology (www.timm2017.org) conference, Bruker today introduces the new, CE-IVD marked Fungiplex® Candida fast diagnostic assay, a multiplex real-time PCR test for the rapid identification of the most common pathogens associated with invasive candidiasis. 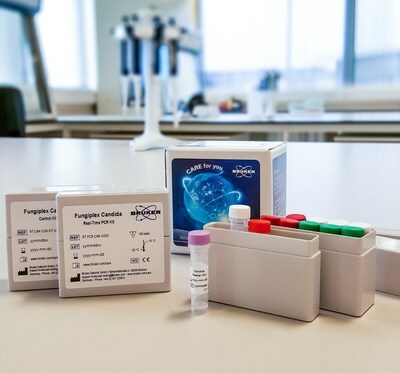 The new Fungiplex Candida assay does not require any culture steps, and typically gives results in just 2-3 hours directly from patient blood, plasma or serum samples. The Bruker microbiology portfolio is led by the MALDI Biotyper(MBT) platform for fast proteomic fingerprinting, a market-leading family of products providing rapid, broad-based molecular identification of microorganisms like bacteria, yeasts and fungi from cultures. Both new IFD tests further expand Bruker's microbiology business, and re-inforce Bruker's additional focus on rapid identification of invasive fungal diseases, followed by antifungal susceptibility testing. The principle of the MICRONAUT system for specialty antimicrobial susceptibility testing is the phenotypic detection of microbial growth inhibition in the presence of antibiotics. Its microdilution procedure is a standardized, globally accepted reference method for the determination of minimal inhibitory concentrations (MICs). The MICRONAUT-AM plate allows for the antifungal susceptibility testing (AFST) of nine antimycotics (including anidulafungin, caspofungin and posaconazol) in up to eleven concentrations, and provides a standardized workflow for analysis with visual or photometric interpretation. MALDI Biotyper® and MBT STAR® are registered trademarks of Bruker Daltonik GmbH in the European Union and other regions.